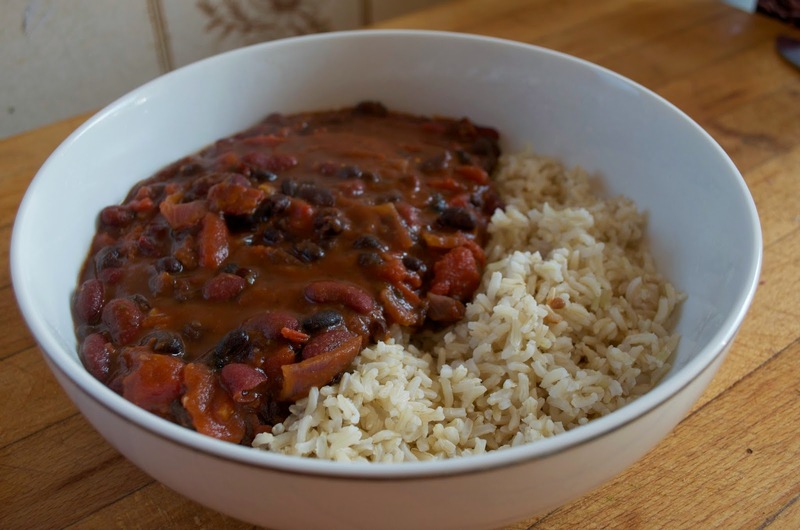 This is my easy and healthy Weekend Two Bean Chilli with Brown Rice. It is an adaption of this recipe from Food Network but with a few less ingredients and a few shortcuts. This was my first time cooking this and it is so good that it will probably live up to it's name and be made every weekend. This can serve however many people you like and the heat can be mild or as spicy as you want it so it is completely adaptable to all tastebuds. It takes no time at all and if you already have cooked brown rice, maybe left over from the day before, it is so easy to whip this up in around 15 minutes. 1. If the rice isn't already cooked then measure and heat as per packet instructions. Typically 60g per person for 25-30 minutes until almost all the water has gone. 2. Whilst waiting for the rice to cook chop the red onion, drain and wash the beans and open the tomatoes. 3. Once the rice has cooked put in the serving dish and cover with a plate to keep warm and moist. 4. Rinse and dry the pan then add a little oil. 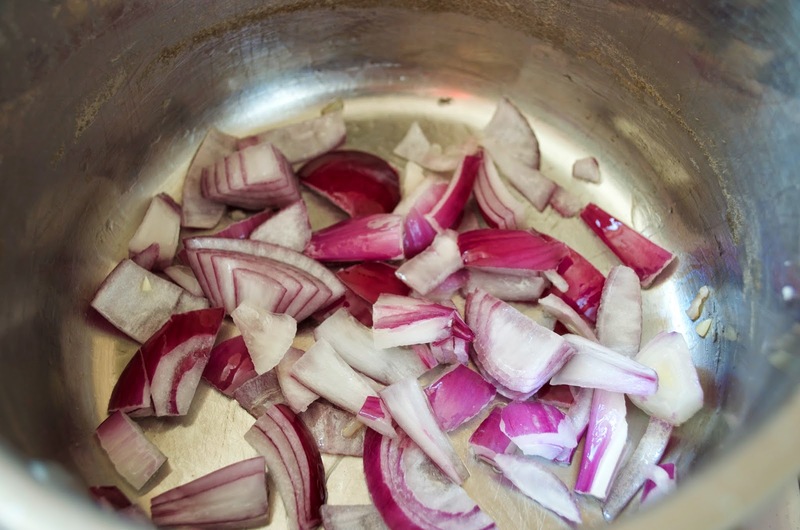 Soften the onions on a medium heat for around 3 minutes then add 1 teaspoon of Chinese 5 Spice and 2 teaspoons of Hot Chilli Powder. The seasonings will dry on the pan so stand back, turn down the heat and add 1/4 cup of warm water. 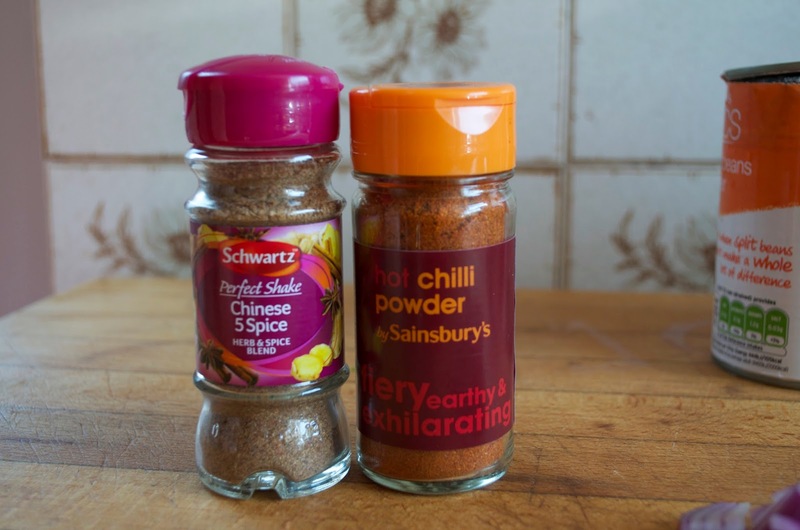 Tip: if you do not want this chilli spicy then add a Mild Chilli Powder or maybe just 1 teaspoon. 5. 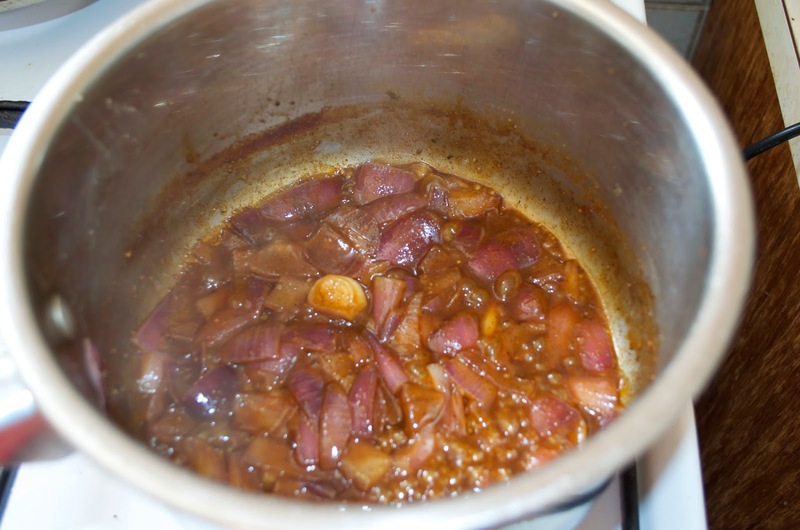 Continuously stir on a low heat and add the Vegetable Stock Cube. Stir for around 4-5 minutes until all the water as reduced. 6. Add the tomatoes and beans and turn the heat back up to medium to allow to warm up for 5 more minutes. This is where you can add more heat if you need to. 7. Spoon the Chilli over the Brown Rice and enjoy! Disclaimer: All ingredients were purchased by myself and cooked by myself, a lot of the ingredients came from one supermarket but this blog is in no way affiliated with them.